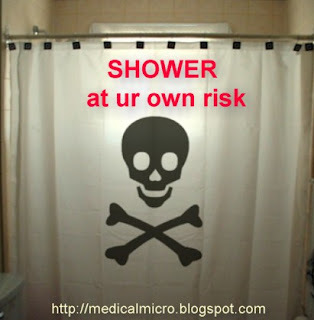 Watch out……… A nice cool shower on a sunny day may get you into some bacterial infection. A recent study says showerheads can harbour tiny bacteria that come spraying into your face when you wash. Though it is a bit comforting that, people with normal immune systems need not fear, but these microbes could be a concern for those with immune suppression like people infected with HIV, cancer patients, geriatrics, transplant recipients. Researchers at the University of Colorado tested 45 showers in five states as part of a larger study of the microbiology of air and water in homes, schools and public buildings. The researchers offer suggestions for the wary, such as getting all-metal showerheads, which microbes have a harder time clinging to. Still, showerheads are full of nooks and crannies, making them hard to clean, the researchers note, and the microbes come back even after treatment with bleach. The bugs in question are Mycobacterium avium, which have been linked to lung disease in some people. Indeed, studies by the National Jewish Hospital in Denver suggest increases in pulmonary infections in the United States in recent decades from species like M. avium may be linked to people taking more showers and fewer baths. Symptoms of infection can include tiredness, a persistent, dry cough, shortness of breath, weakness and "generally feeling bad. The researchers sampled water flowing from the showerheads, then removed them, swabbed the interiors of the devices and separately sampled water flowing from the pipes without the showerheads. By studying the DNA of the samples they were able to determine which bacteria were present. They found that the bacteria tended to build up in the showerhead, where they were much more common than in the incoming feed water. In previous work, M. avium was found in soap scum on vinyl shower curtains and above the water surface of warm therapy pools. M. avium can be a danger because in a shower "the organism is aerosolized where you can inhale it."